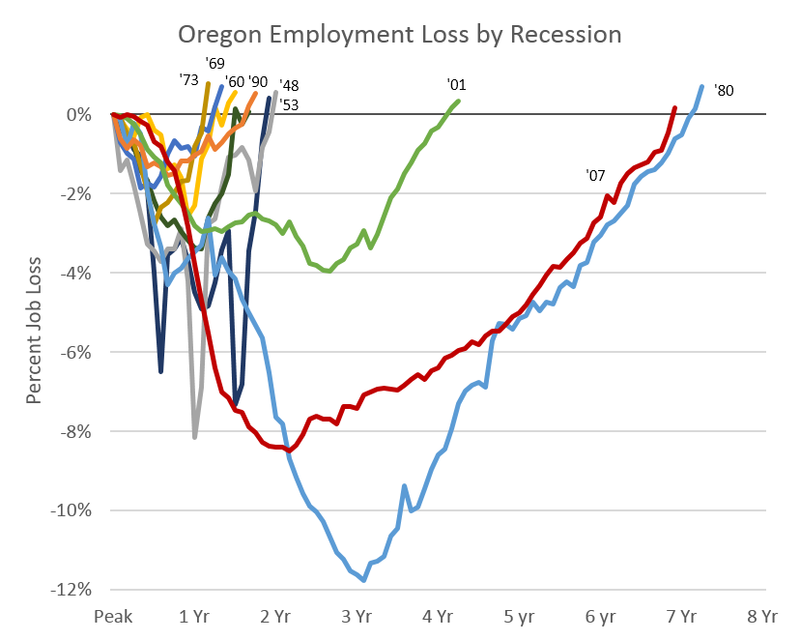 Oregon just passed a big milestone in the recovery, having regained all of its lost jobs from the Great Recession. As we wrote last month: “Of course, reaching pre-recession levels is not an end goal, but it is an important milestone.” See that report for a good, big picture summary of the recovery so far. The bonus good news is that our office can now retire this graph comparing job losses across recessions. We have made it out. Even a hair quicker than expectations and ahead of the 1980s recovery. Of course the economy is still not firing on all cylinders, even if the recent data flow is more positive and encouraging. Furthermore, our office can now start talking again about the strength of the net expansion. That is, how many jobs are we adding above and beyond pre-recession peak levels. It’s been 3 years since we have showed this graph, but it’s dusted off now, upgraded to the latest version of Office and ready to go. 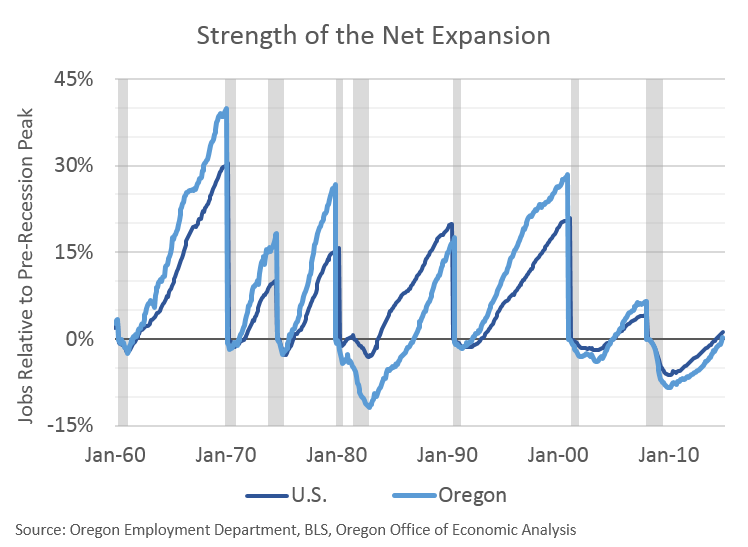 In 5 of the previous 6 expansions, Oregon’s net growth has outpaced the nation. The exception being the 1980s recovery when Oregon lost 4 times the number of jobs as the typical state (in percentage terms) and even then, we nearly caught up. In 5 of the previous 6 expansions in Oregon, the state has added 15% or more in terms of total jobs, above and beyond pre-recession levels. The exception being the housing boom recovery, which was by far the weakest and most lackluster expansion on record, prior to the Great Recession. This recovery has been slower still. However it appears to be gaining speed both in the second tier metros across Oregon and, more broadly, nationwide. The economy is now on the upswing and Oregon is growing faster than the average state, per our usual pattern. Yes, Oregon still lags the average state relative to pre-recession peaks, however that gap is closing fast and Oregon has already made up 60% of the gap. Lastly, how do these strong job reports relate to the kicker given we are so close today? The short answer is that we are still not forecasting a kicker, even with big employment reports the past 2 months. The reason is we have stronger job and stronger wage growth built into the forecast already. Our office is also expecting a big April for income tax collections. The combination of stronger growth and a big April bring us nearly to the kicker threshold, but not over it. To breach the threshold we would need to see exceptional growth. Yes, these jobs reports, if they are correct, are exceptional, however we have yet to see a corresponding jump in withholdings out of paychecks. Withholding today is growing faster than much of the recovery, however not quite as strong as the job numbers indicate. At least not yet. Our office is still in a wait and see mode regarding the kicker.